Top Prospect: Garin Cecchini, Projection: Pawtucket – Cecchini entered 2013 as the top corner infield prospect in the system by far, and proceeded to only strengthen his hold on the top spot. Cecchini made progress, both at the plate and in the field, across two levels, eventually showing the ability to barrel up more advanced pitching in Portland. Cecchini’s carrying tool is his hit tool, as he has exceptional bat-to-ball skills. His swing is smooth and aesthetically pleasing, lending itself to hard line drives to all fields. He also has an advanced approach and knowledge of the strike zone, although at times he can get overly selective at the plate and let hittable pitches go by. Cecchini did a better job incorporating his lower half into his swing in 2013, but he still does not generate the power one would assume someone with his frame to have. How much power Cecchini projects to hit for is a divisive topic with some talent evaluators projecting him to hit 12-to-15 home runs, while others see him closer to 18-to-20 with a chance to hit 20-plus in his prime. With Cecchini, it might come down to whether or not he is willing to sacrifice some average in order to sell out for power, something he has specifically said in interviews that he is not interested in doing. Defensively, Cecchini does not project to be a plus defender, though he could eventually be average at third base. He has plenty of arm for the position, but his actions in the field are stiff and lack fluidity. If he has to move off the position, Cecchini is athletic enough to be able to handle left field, though he could also project as a first baseman. 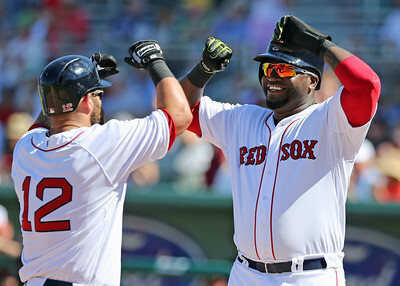 Stock rising: Rafael Devers, Projection: GCL – Devers (pictured, left) received the largest bonus of the Red Sox’s July 2nd signings, receiving $1.5 million. Though he has yet to debut in game action, the reports coming back from his workouts prior to signing and from the Fall Instructional League were very encouraging. Only 16 years old, his body is already relatively mature. The excitement associated with Devers comes at the plate, where he projects to hit for both average and power. 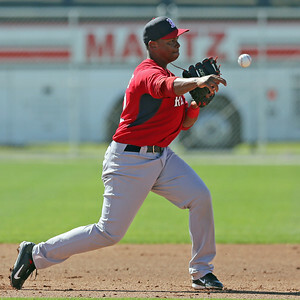 Devers has a natural swing with plenty of batspeed, and he has already shown the ability to hit to all fields. Defensively, there are questions about whether Devers will even be able to stick at third base, as he could get too big for the position as he fills out. If he hits as projected, his defensive profile will not matter. Devers is one of the more exciting international prospects to enter the system recently and looks poised to skip over the DSL and debut stateside this summer. As good a prospect as he is, the Red Sox have never put a player as young as Devers higher than the GCL - even Xander Bogaerts started in the DSL. Sleeper: Nick Longhi, Projection: Lowell – Though he slipped to the 30th round in the 2013 draft due to signability concerns, Longhi still received the fourth highest bonus of any 2013 Red Sox draftee. Longhi is a below-average runner and profiles best at first base or left field, both positions where his bat will have to carry him. Reports on his bat coming out of his senior year of high school were mixed, however, as he struggled, especially against solid velocity. He did show raw power potential and a strong arm—he also pitched. If Longhi can show that he can handle professional pitching and his hit tool takes a step forward during spring training, he should have a chance to break camp with Greenville and rise up the prospect ranks. 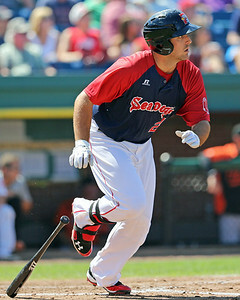 At a crossroads: Travis Shaw, Projection: Portland – Shaw gets this label not so much because this is a make-or-break year, but rather one that should show whether or not he projects as a potential long-term answer at first base. In the lower minors, Shaw showed an advanced approach and solid pitch recognition skills. He still gets his fare share of walks, but the quality of his at-bats seemed to regress last season, as he was consistently falling behind in the count and getting caught off-balance against secondary pitches. Shaw only has average batspeed and has struggled against high velocity, especially when it is elevated. His swing is a little long, but when he squares up the ball, he has shown the ability to drive it with backspin. Though he has a power hitter’s frame, Shaw projects to have only average power, mainly pull-side. David Chester, Projection: Salem – Possesses plus raw power that translated into game action last year. Could struggle with quality pitching as he moves up in the system as he lacks batspeed and struggles with secondary pitches. Kevin Mager, Projection: Greenville – Though he went undrafted, Mager was one of Lowell’s best hitters last year, putting together quality at-bats and showing gap power to all fields. Photo credits: Will Middlebrooks & Garin Cecchini, Rafael Devers, Travis Shaw, and Mike Napoli & David Ortiz, all by Kelly O'Connor. Ian Cundall is Director of Scouting of SoxProspects.com. Follow him on Twitter at @IanCundall. Chris Hatfield is Executive Editor of SoxProspects.com. Follow him on Twitter at @SPChrisHatfield.